Sasha Adler first captured my attention when she was featured in House Beautiful last year in the "I love my bed" feature. I was happy to stumble across her recent feature in Lucky Magazine where she documented a weeks worth of outfits. As a co-design director for Nate Berkus, her style seems to transcend interiors. She is enviably stylish- I think you'll agree!? 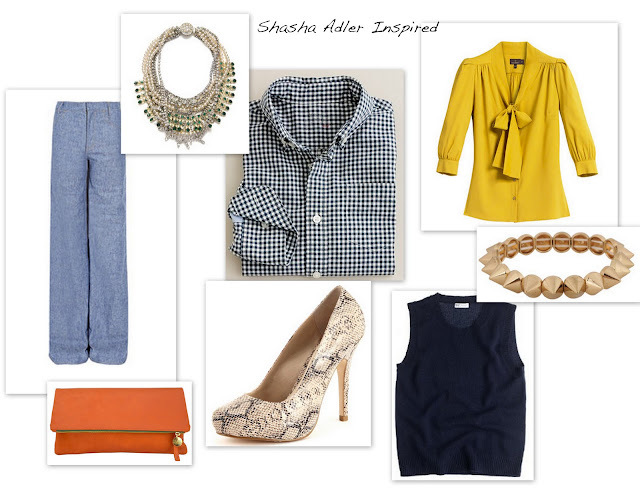 So I collected some Sasha inspired pieces that I'd like to add to my closet. My favorite style tip that she shared? She shops the button-ups at crew cuts for the perfect fit!